MEDCALF, FRANCIS HENRY, millwright, ironfounder, Orangeman, and politician; b. 10 May 1803 at Delgany, County Wicklow, Ireland, son of William and Martha Medcalf; d. 26 March 1880 at Toronto, Ont. Francis Henry Medcalf’s parents emigrated to Upper Canada with their eight children in 1819 and settled on the Big Otter Creek in Bayham Township on land bought from Thomas Talbot*. About 1823, Francis Henry moved to Philadelphia where he worked as a blacksmith and millwright. He returned to Upper Canada in 1839, living in Toronto, and by 1843 he had his own business as millwright and machinist. In 1847 he opened the Don Foundry and Machine Shop, specializing in agricultural implements and machinery, in steam engines, and in heavy castings for grist- and sawmills. Philadelphia in the 1830s was a battleground between Irish Roman Catholics and Protestants; Medcalf was for the rest of his life the staunchest of Orangemen. He was several times master of Lodge 275 in Toronto, district (later county): master for Toronto from 1854 to 1862, and from 1862 to 1864 provincial grand master of Canada West. In 1860 Medcalf first ran for office and was elected alderman in Toronto; he sat again in 1863 and from 1867 to 1871. His lodge service took him into the mayoral election of January 1864. The separate school controversy was at its height in 1863 and a coalition of Liberals (marshalled by George Brown’s Globe), Orangemen, and Tories brought him forward to oppose Mayor John G. Bowes*. Bowes, a defender of separate schools, was said to be too clever as well as too deceitful. Medcalf, a simple mechanic risen by hard toil, was pictured by contrast as honest and bluff, with no pretence to skill in argument or finesse in finance. He was also the adamant Protestant candidate. He deprived Bowes of a seventh term. In 1865 Medcalf won the mayoralty overwhelmingly and in 1866 he was not opposed. So seriously did he take this mandate that in 1866 cooler heads had to restrain him from precipitating bloodshed on St Patrick’s Day, when fears of a confrontation with Fenians were high. From 1867 to 1873 the city council chose the mayor, but when the system of popular election returned in 1874 Medcalf once again received most votes. By 1876, however, when even supporters acknowledged his torpor, he was heavily defeated. Already in March 1871 he had been beaten in the provincial constituency of East Toronto by Matthew Crooks Cameron*. Medcalf married Mary Harrison of Philadelphia in 1831, and they had six children. The four sons were brought into their father’s trade; the third son, Alfred, entered into a partnership with his father and took over the foundry after Medcalf’s death in 1880. A favourite with the ambitious and the common man alike, Medcalf was nicknamed “Old Square-toes,” pointing up his utilitarian boots, and he gloried in the name as a mark of his incorruptible ordinariness. The only matters which aroused him to anger and eloquence were Catholic assertiveness and slurs on the Orange order. He had been a man who joined fraternal societies, and his long funeral procession included Orangemen, freemasons, oddfellows, and foresters. MTCL, Toronto Public Libraries scrapbooks, II, especially election card for 1874. PAC, MG 26, A (Macdonald papers), 237, Gilbert McMicken to Macdonald, 18 March 1866. St James’ Cemetery (Toronto). Loyal Orange Association of British North America, Grand Lodge, Annual Reports, 1847–57. Toronto, City Council, Minutes of proceedings, 1860–71, 1874–76. Globe (Toronto), 1860; January 1861; December 1863; January, December–1864; January, December 1865; January 1866:; January 1874; 1875–76; 29 March 1880. Leader (Toronto), December 1863; January, December 1864; January, December 1865; January 1866. Mail (Toronto), 29 March 1880. City of Toronto directory, for 1867–8 (Toronto., 1867). Commemorative biog. record, county York, 626–27. Cyclopædia of Can. biog. (Rose, 1886), 124. The Toronto directory and street guide for 1843–4, ed. 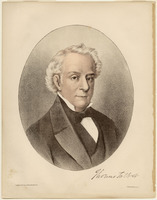 Francis Lewis (Toronto, 1843). Hist. of Toronto and county of York, 11, 108–9. Landmarks of Toronto (Robertson), VI, 153–64, 195. Middleton, Municipality of Toronto. S. B. Warner, The private city: Philadelphia in three periods of its growth (Philadelphia, 1968). Barrie Dyster, “MEDCALF, FRANCIS HENRY,” in Dictionary of Canadian Biography, vol. 10, University of Toronto/Université Laval, 2003–, accessed April 22, 2019, http://www.biographi.ca/en/bio/medcalf_francis_henry_10E.html.